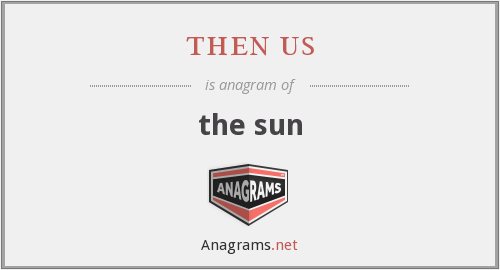 What anagrams are available for the sun? This page is about an anagram for the word then us that can be used in word games, puzzles, trivia and other crossword based board games. What does the sun mean? The Sun is a daily tabloid newspaper published in the United Kingdom and Ireland. It is published by the News Group Newspapers division of News UK, itself a wholly owned subsidiary of Rupert Murdoch's News Corp. The Sun had the largest circulation of any daily newspaper in the United Kingdom, but in late 2013 slipped to second largest Saturday newspaper behind the Daily Mail. It had an average daily circulation of 2,069,809 copies in March 2014. Between July and December 2013 the paper had an average daily readership of approximately 5.5 million, with approximately 31% of those falling into the ABC1 demographic and 68% in the C2DE demographic. Approximately 41% of readers are women. The Sun has been involved in many controversies in its history, including its coverage of the 1989 Hillsborough football stadium disaster, among others. On 26 February 2012, The Sun on Sunday was launched to replace the defunct News of the World, employing some of its former journalists. National editions are published in London, Dublin and Glasgow. The average circulation for The Sun on Sunday in March 2014 was 1,686,840. In late 2013, The Sun on Sunday was given a new look, accompanied with a new type-face. "then us." Anagrams.net. STANDS4 LLC, 2019. Web. 19 Apr. 2019. <https://www.anagrams.net/term/32371070>.